Ron Lazebnik primarily teaches the Samuelson-Glushko Intellectual Property and Information Law Clinic. He has assisted clinic students with a number of significant legal matters, including the filing of amicus briefs in important IP cases before the U.S. Court of Appeals for the Second Circuit. In 2012, under his leadership, the clinic became a part of the U.S. Patent and Trademark Office pilot programs to allow students to practice before patent and trademark examiners. 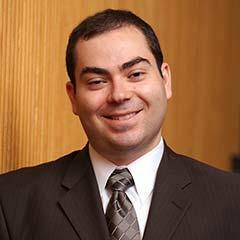 His academic and scholarly interests include IP law, information law, and Internet law. Before joining Fordham Law, he was in private practice, where he helped represent clients in various matters involving patents, copyrights, trademarks, trade secrets, and general commercial litigation. He has also assisted in the defense of corporations and government agencies being investigated by the SEC, the Public Company Accounting Oversight Board, and the U.S. Department of Justice. Professor Lazebnik is a graduate of Harvard Law School, where he spent time as a Massachusetts SJC Rule 3:03 student attorney and as the Director of Research and Technology for the Harvard Legal Aid Bureau. He also served on the staff of the Harvard Journal of Law and Technology and contributed to GartnerG2’s and the Berkman Center for Internet & Society’s 2005 white paper “Copyright and Digital Media in a Post-Napster World.” Prior to law school, he received an MS in electrical engineering from Case Western Reserve University.